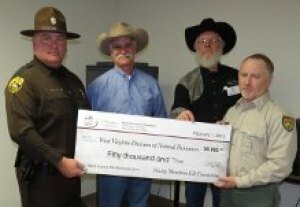 SOUTH CHARLESTON, W.Va. - At the regular quarterly meeting of the Natural Resources Commission held Sunday Feb. 22, 2015, in South Charleston, Bill Carman, Regional Director for the Rocky Mountain Elk Foundation (RMEF) and its West Virginia State Chapter President Brian Satterfield presented a Seed Grant check in the amount of $50,000 to the West Virginia DNR for its active elk restoration program. These funds can now be used by WVDNR to support its active elk restoration program. RMEF has been instrumental with the restoration of elk in Kentucky and Virginia just astride of the Mountain State’s designated southwestern coalfields elk zone consisting of all or parts of Logan, Mingo, Wyoming, McDowell, Lincoln, Wayne and Boone counties. The commissioners and WVDNR Chief of Wildlife Resources Curtis Taylor thanked RMEF for this generous contribution, which is designated to kick-off the program. Revenues for such grants are generated by fundraising banquets held by local chapters here and elsewhere. West Virginia presently has four active chapters. “The mission of the Rocky Mountain Elk Foundation is to ensure the future of elk, other wildlife, their habitat and our hunting heritage,” Carman said. Accepting the contribution on behalf of WVDNR were elk zone wildlife and law enforcement coordinators Randy Kelley and Sgt. Terry Ballard, respectively.